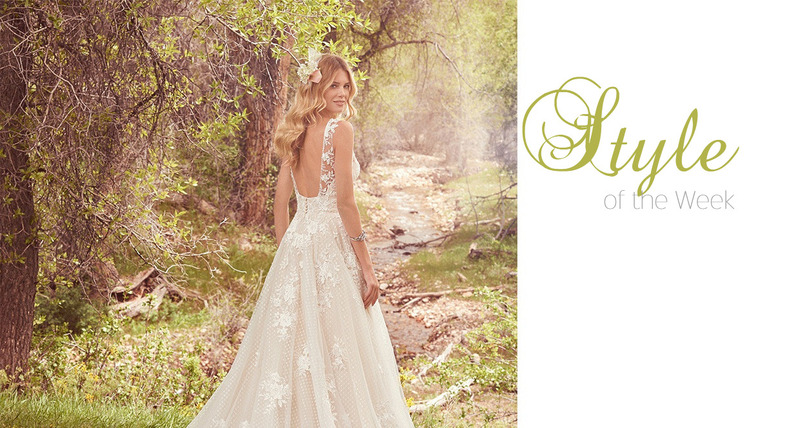 This blog post is part of a new series by Noiva’s titled Style of The Week, whereby we highlight charming bridal creations from our extensive collection, one dress at a time. This week, our eyes are set on a beautiful vintage-inspired A- line gown dubbed Meryl by award-winning bridal label Maggie Sottero, which specializes in weaving internationally sourced fabrics and handcrafted adornments into dazzling wedding dresses that appeal to brides all over the world. Part of Noiva’s extensive bridal collection, the dress unfolds as a harmonious interplay of lace appliqués, beaded detailing and Swarovski crystals, subtly draped over whimsical layers of dotted tulle and dashing organza to create an ethereal texture of elegance and taste. Perfected with a sensational plunging neckline and graceful chapel train, Meryl also features lace-accented illusion straps that suavely descend into a flawlessly-crafted square back, finished using covered buttons overlaying its zipper closure. All of the elements making up this gown ultimately intertwine to convey enthralling movement with every step, ensuring the bride wearing it is nothing short of a walking fairytale on her big day. Meryl rightfully relays the Maggie Sottero line’s signature flair for the classic modern-day bride. “Our core collections feature shimmering embellishments and lightweight fabrics in a variety of captivating designs,” the brand’s website reads. And our style of the week pick is surely one of them! Established in 1997, Maggie Sottero designs commemorated its 20th anniversary earlier this year, further establishing itself as a leading name in the bridal industry with an ongoing commitment to delivering timeless elegance at an affordable cost. Would you wear Meryl on your wedding day? Discover this dress and many more at our showroom! A small guide for you to help navigate your way through all the gorgeous white wedding gowns based on your body figure.